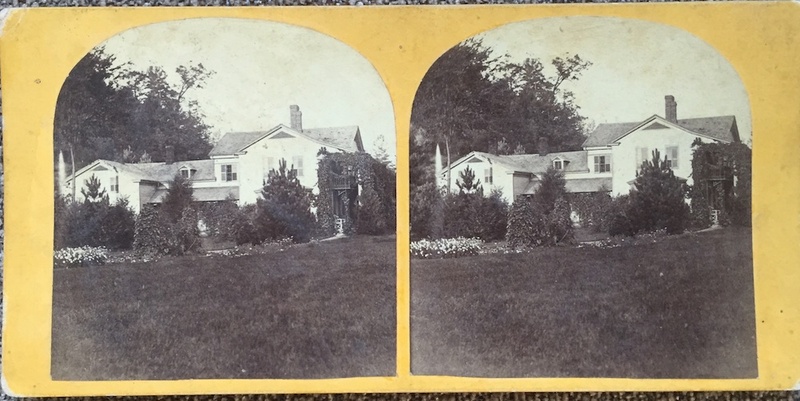 This stereoview provides an opportunity to study some of the changes made to the Glen Iris over the years. The image was probably taken in the 1870s and shows some of the early improvements Mr. Letchworth had made to the structure after he purchased it in 1859. The photographer stood on the south lawn to capture the full length of the Glen Iris. Part of the famous fountain can be seen on the far left. The grounds are nicely landscaped, and the balcony off the Cherry Room is visible. 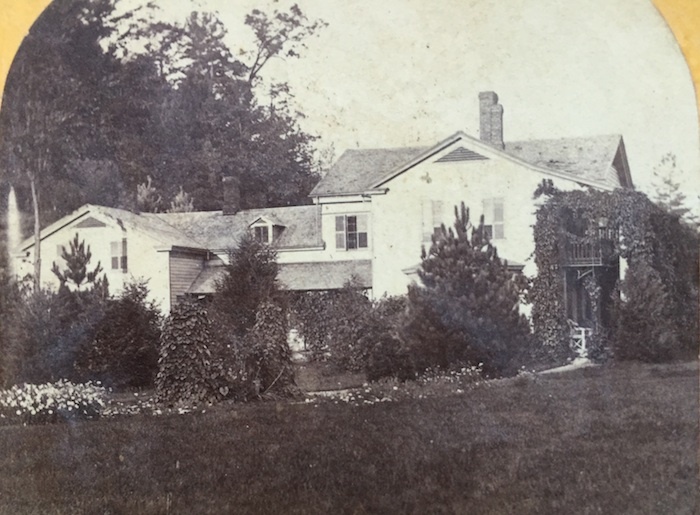 It is said that Mr. Letchworth added the balcony for his brother Josiah and his new bride Mary Skinner shortly after their marriage in 1865. A major change in the Glen Iris came in 1880 when Mr. Letchworth hired the well known Buffalo architect Alexander F. Oakley to enlarge his cramped homestead. The most notable exterior alteration was the addition of a third story that would hold the owner's study (which looks out over the Middle Falls) and several other rooms. Oakley managed to add the new floor while maintaining the building's original classical lines. (See Image 30.) Changes inside the Glen Iris at this time include the beautiful Stairway Tower, Mr. Letchworth's Library (now the Gift Shop), and the Hallway guests now use to reach the Dining Room. The next major change to the lines of the building, so noticeable in the two images below, was the result of the renovations made in 1913 by the American Scenic and Historical Preservation Society. The work included the addition of a number of guest rooms on floors extending west from the main structure. This was done in preparation for the opening of the Glen Iris as an Inn and Restaurant. Later additions, visible below in the modern photograph by Ann Liberatore, were built in the late 20th century to expand and improve the popular restaurant facility. The first dining room addition was completed in 1973. A second addition which was an extension of the lower section was finished in 1978. Bathrooms were built on the next year, with the kitchen addition completing the Glen Iris' modern footprint in 1982. 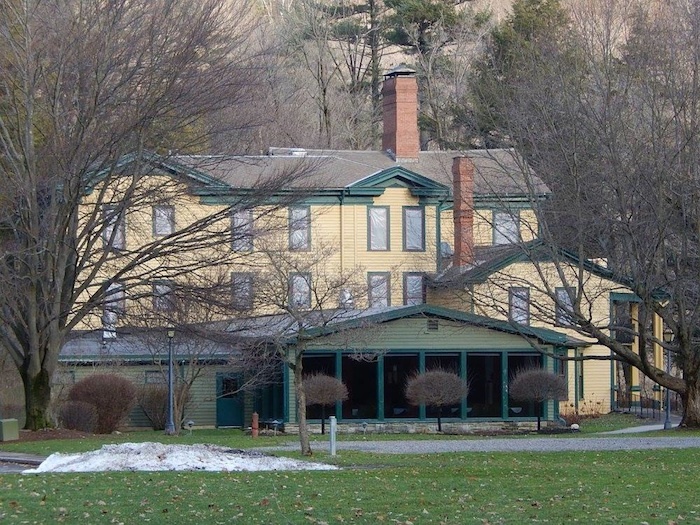 The Glen Iris Inn today offers more than fine dining and lodging. It also presents to the visitor a lesson in the many changes that have taken place in the building and the Park in the last century and a half. We would like to thank Gary Passamonte for sharing the stereoview and Ann Liberatore for allowing us to use her modern photograph of the Inn. Information on the 1880 and 1913 renovations comes from the work of Ted Bartlett. We also thank Charles King for providing dates for the recent additions.